Richard Smith was born in Scotland and educated at the University of Glasgow. He trained as a doctor in Glasgow and in London, obtaining his MRCOG in 1988 and graduating with an MD from the University of Glasgow on cervical cancer, immunity and infection in 1992. Thereafter, he worked as lecturer and senior lecturer at Charing Cross and Westminster Medical School. He then became Director of Gynaecology at Chelsea and Westminster Hospital and became visiting associate professor at NYU Medical Centre in New York. 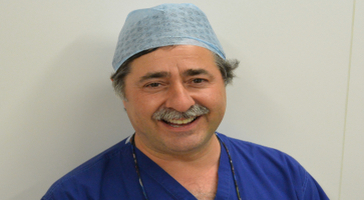 For the last 6 years, he has been based at the West London Gynaecological Cancer Centre, Queen Charlotte’s & Chelsea Hospital, Imperial College London. Mr Smith was made an adjunct associate professor at NYU Medical Centre. He has a long running interest in doctor / patient communication and is the series editor for a series of books entitled Patient Pictures which has sold 240,000 copies. He is also editor of the Atlas of Gynaecological Oncological surgery which is now in its 4th edition due in 2016 and over 20 books published. He has written a number of other books, peer reviewed over 130 publications and over 50 other non-peer reviewed publications. Mr Smith is the leader of the UK Uterine Transplantation research team, a project he has been involved with for the past 15 years. His other current research interests include fertility sparing surgery for women with cancer. He has lectured on the subject of HIV in obstetrics, gynaecology and fertility sparing surgery for cervical cancer in the UK, across mainland Europe, Russia, South Africa and the United States.